In the late seventeenth century, all roads really did lead to Rome for the aspiring musician. There, wealthy aristocrats-turned-priests and Catholic nobility from across Europe vied for cultural status through artistic patronage. In particular, the young Pietro Ottoboni (1667–1740) reigned supreme among patrons of music, supporting among others Caldara and Albinoni, Alessandro Scarlatti and his son Domenico, and Handel, all of whom inspired and were inspired by one another. Musical gatherings of the time – called conversazione – often featured dramatic cantatas as well as virtuoso instrumental showpieces such as the works featured on this album. 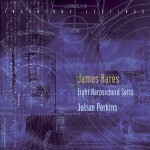 Recalling this fertile musical era, rising star countertenor Andrew Radley with Julian Perkins and his London-based period instrument ensemble Sounds Baroque, dispatch these entertaining vocal works with aplomb, interspersed with virtuosic harpsichord works performed to perfection by Perkins. 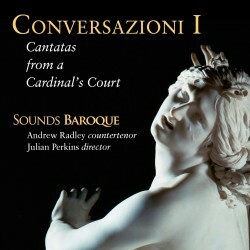 With this, the first in a series of conversazione recordings, Sounds Baroque celebrates the passion, theatricality and sheer variety of music from the 17th and 18th centuries.